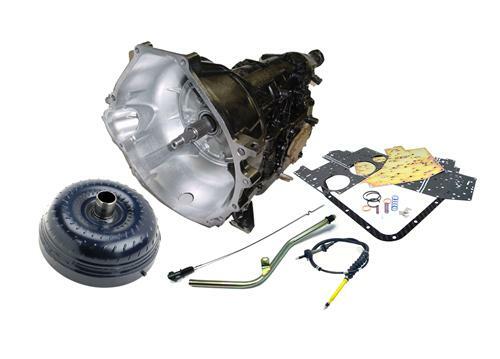 We no longer carry the 1987-93 Mustang AOD Street Smart Transmission Kit. Check out 1979-1993 Mustang Automatic Transmission for an updated selection. Get the Performance Automatic Street Smart AOD Transmission Restoration Package for your 5.0 Mustang! Latemodel Restoration Supply is proud to offer this 5.0L Automatic Transmission, AOD, Super Street kit to get your 87-93 5.0L Mustang shifting better than ever. Factory AOD transmissions are notorious for sloppy shifting. This 4 speed AOD transmission kit enhances your transmission's shifting abilities for better performance. This transmission is a direct replacement for the 87-93 5.0L Mustang and meets or exceeds OEM specs! This Complete transmission kit includes an AOD Street Smart transmission with all the upgrades, Street Smart 12" Non-Lock up stall converter, New Block Plate, New TV Cable, New Shifter Cable, Dipstick & Filler tube, as well as a new flexplate. This Automatic transmission restoration package is ideal for restoring or upgrading your 87-93 5.0L Mustang. This package is rated to handle up to 450hp and is covered by Performance Automatics Lifetime warranty! This Performance Automatic AOD transmission has been redesigned to handle more horsepower and torque to give you the best performance in your Foxbody. This transmission features heavy duty clutches, upgraded servos, a street/strip valve body, heavy duty 3-4 clutch pack, Raybestos pro hi-performance wide band, and a chrome pan w/ drain plug. - Will work on 1986 Models if 87-93 style throttle body is used.